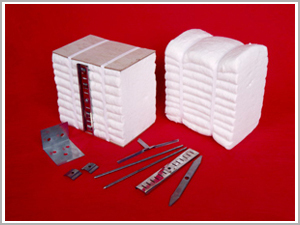 We are leading Ceramic Fiber Module exporters that do not contain any binders. We make use of special equipment for producing fiber modules to confirm the dimensions. 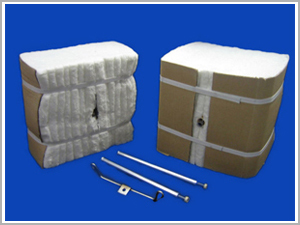 The installation of these products is easy and speedy and helps in constructing lining of furnace. The modules can be connected with kiln and furnace by anchor. Ravani Ceramic’s fiber modules are manufactured in several configurations. Attachment systems are provided if required in meeting wide range of applications. They can be easily fastened to interior steel shells of various types of heating processing equipment along with several attachment systems. 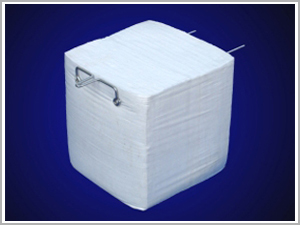 Moreover, they are excellent energy saving and insulating effects and also has low heat storage. The fiber modules improve refractory and insulating integrity of furnaces, kilns and construction processes. These modules are available in different sizes. The modules are made from high quality spun fiber blanket which are later folded and compressed for storing in several dimensions. The availability of high density blocks or standard blocks in each temperature grade results in the kind of product that meets a wide range of application needs. Ravani Ceramics is as ceramic fiber module suppliers in India make sure of maintaining their quality parameters similar everywhere. With years of customer loyalty and market demand, they need to maintain their position of being the top ceramic fiber module exporters. The standard size modules are 305h305h300 packed in boxes. Thermal stability and properties are retained after repeated applications.